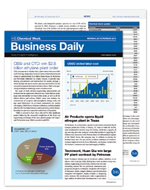 Business Daily is an exclusive daily digest of insider intelligence, delivered in the form of e-newsletter directly from the desk of CW’s Editor-in-Chief. If you already have a standard subscription to Chemical Week, you can upgrade your account. If you don't have a subscription to Chemical Week, you can subscribe to Chemical Week Premium.